A new two-legged robot is stepping over obstacles and keeping its balance in check – even when it's being kicked. Though funded by the Pentagon’s Defense Advanced Research Projects Agency (DARPA), engineers hope the design will have civilian applications. Researchers at the Oregon State University (OSU) Dynamic Robotics Laboratory have showcased the latest in the ATRIAS series of robots, a bipedal machine based on the movements of birds rather than humans. This particular approach has enabled the robot to overcome obstacles, a major step in the journey towards running around in the wild. “When this robot gets up to speed for walking...it will be the fastest bipedal robot in the world,” Jonathan Hurst, an associate professor at the OSU College of Engineering, told reporters. ATRIAS has legs made of lightweight carbon-fiber, mounted to elastic fiberglass springs that act both as a suspension and a means of mechanical energy storage, allowing the robot to run around on a fairly small battery charge. There are two other ATRIAS robot operations in the US – at the University of Michigan and Carnegie Mellon University – but the OSU robot has captured all the media attention, partly because it has its own Twitter account. 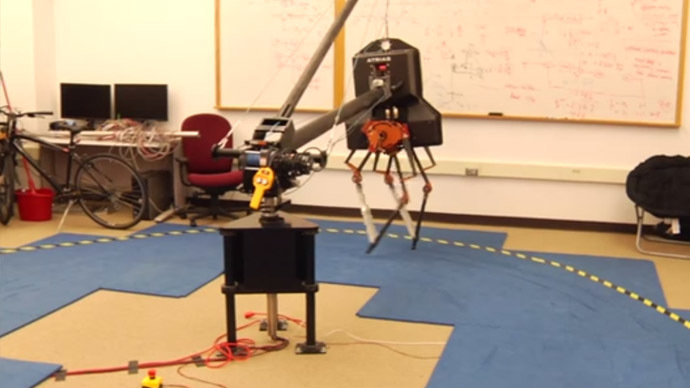 DARPA is also funding other robot projects, including the four-legged robot dog “Spot,” showcased last month by the Google-owned Boston Dynamics. According to the OSU robotics team, ATRIAS will appear for a live outdoor demonstration at the DARPA Robotics Challenge, scheduled for June 5-6 in Pomona, California.